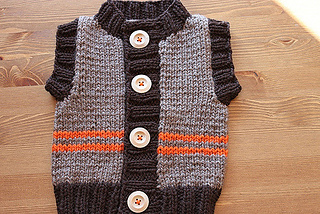 A cardigan-style vest sized from 3 months to 4T, Chunky Monkey will knit up fast using chunky weight yarn and will look adorable on any little one! 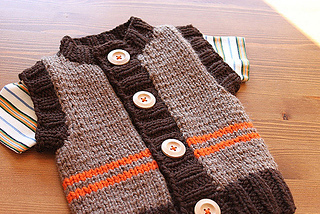 It’s knit in one piece from the bottom to the underarm using circular needles, then the back piece and each front piece is worked separately. Shoulders are attached using the 3-needle bind off technique, although notes are given if you’d prefer to seam shoulders together by hand instead. 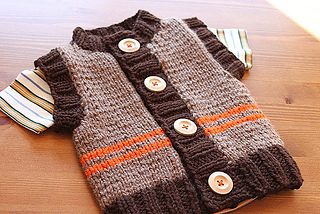 Buttonband, neckband, and armband ribbing is created by picking up stitches at the end.